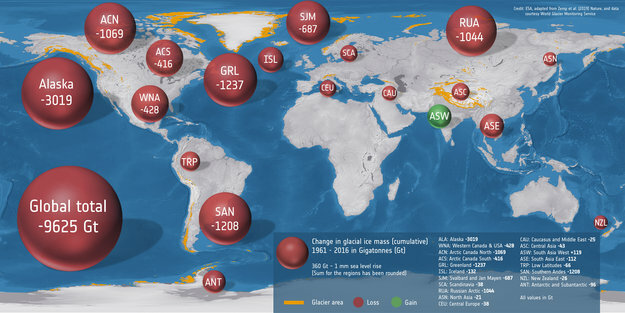 Apr 8, 2019 • When we think of climate change, one of the first things to come to mind is melting polar ice. However, ice loss isn’t just restricted to the polar regions. According to research published today, glaciers around the world have lost well over 9,000 gigatons (nine trillion tons) of ice since 1961, raising sea level by 27 mm. An international team led by the University of Zurich in Switzerland used classical glaciological field observations combined with a wealth of information from various satellite missions to painstakingly calculate how much ice has been lost or gained by 19 different glacierized regions around the world. Their research, published in Nature, reveals that glaciers lost 9,625 gigatons of ice between 1961 and 2016. Interestingly, the only area to have gained ice over the 55-year period was southwest Asia (noted on the map as ASW). Here, glaciers amassed 119 gigatons of ice, but neighboring southeast Asia (ASE) lost around the same amount, 112 gigatons. ESA’s Climate Change Initiative – a research program focused on generating global datasets for the key components of Earth’s climate, known as essential climate variables – was also key to the research. Frank Paul, co-author of the study explains, “Glacier outlines are needed to make precise calculations for the areas in question. To date, this information came largely from the U.S. Landsat satellites, the data from which are delivered to European users under ESA’s Third Party mission agreement. Digital elevation models, which provide topographic details of a region, were calculated using information from the Japan Aerospace Exploration Agency’s ASTER sensor on the U.S. Terra mission and Germany’s TanDEM-X mission. Both sources were processed within the Glaciers Climate Change Initiative and other projects. These data, along with the comprehensive glaciological database compiled by the World Glacier Monitoring Service, allowed the researchers to reconstruct ice thickness changes of 19,000 glaciers worldwide. Zemp, M., M. Huss, E. Thibert, N. Eckert, R. McNabb, J. Huber, M. Barandun, H. Machguth, S. U. Nussbaumer, I. Gärtner-Roer, L. Thomson, F. Paul, F. Maussion, S. Kutuzov, and J. G. Cogley. 2019. “Global glacier mass changes and their contributions to sea-level rise from 1961 to 2016.” Nature. doi: 10.1038/s41586-019-1071-0.